Well, we didn't make it out to any organized Earth Day events today or pick up garbage at a local park but we sure did get up close and personal with the natural world. My boys regularly interact with nature in the most inspiring way. They climb trees, walk on logs, build forts with sticks and logs they find....I mean the list goes on. They love being in nature but what really interests and inspires me is how they move when they're doing it. They're climbing and squatting and crawling and hanging. They're always inspiring me to get more physical too. 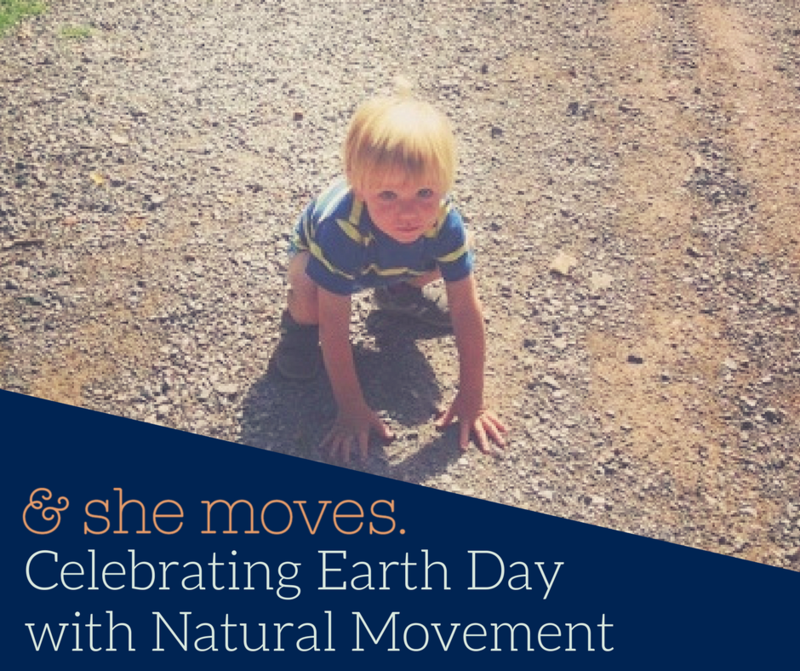 Here are a few tips to help you get physical with your kids, for Earth Day and everyday. I often find myself checking my phone or daydreaming(slash thinking of all the millions of things I need to do!) while the boys are busy playing. But when I actually join in, they love it and it gets me moving and active! At the playground try hanging from the monkey bars or climbing up and down the structure on a rope or whatever is there. Walk on a balance beam or the wooden outline around the playground. Head to the trails at High Park as it promotes movement for everyone. I like to park FAR AWAY from the playground so we have to do some walking and then usually find an area where they can build a fort. Try hanging (or climbing) from a tree or again walking along a log. Kids love to pretend to be animals and I find that adults can usually let their inhibitions go if it's a game. Take turns with your kids choosing what animal you'll pretend to be and then get busy running, crawling or flying around. Hide and Seek and Tag are always a hit too! Easy way to get everyone moving and engaged. Grab a soccer (or some kind of ball) and head to the backyard and park for a nice and easy way to keep your little ones happy! Got a wee little one? That's the perfect time to enjoy the great outdoors. Babies always seem happier when they can look up at the trees and we're so lucky here in Toronto to have a ton of great places to enjoy the natural world. The Beaches Boardwalk is a good one for strollers. The trails at High Park make you feel like you're not even in Toronto anymore! Manageable with a stroller but a baby carrier will allow you to go "off road" even more. The Humber Butterly Garden is amazing! You can walk (or bike) the whole way out there along the waterfront or there's lots of parking out there. We love taking a picnic and spending a good couple hours by the water. Evergreen Brickworks is always a hit and has great food (and coffee). Easy trails and lots of interesting things for older kids to look at including turtles, frogs and fish. Life with babies, toddlers and even big kids can feel a bit monotonous and draining but moving with your kids will help you feel more connected and inspired! I'd love to hear your ideas how you get active with your little ones. Feel free to share below. Now get out there and enjoy the sun!